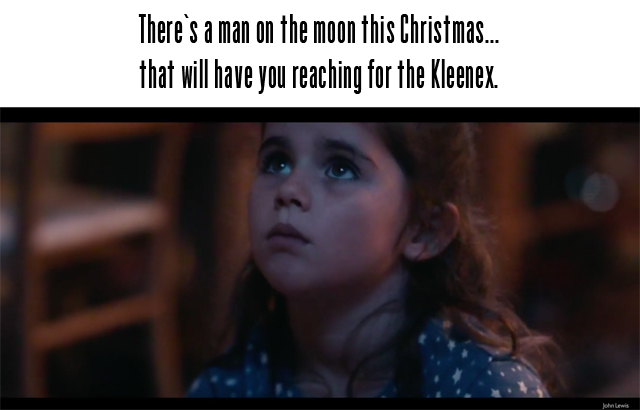 John Lewis is famous for tugging at the heartstrings around the holiday period and for Christmas 2015 their advertisement once again delivers on the need for tissues. For Christmas 2015, John Lewis decided to take the story of the Man on The Moon and make it a festive reality. Only that poor old man on the moon has been alone up there for sometime and it is anything but delightful. Then a little girl comes into his life. Stretch with me here, people. Christmas is all about fantasy, right? Well, the little girl comes into his life and delivers something that will change that. John Lewis - you are the master of Christmas cheer, and once again you have brought about a lesson to us all and a reminder that no one is to be ignored this Christmas. I can see children all over the UK and beyond thinking of those in their lives that might need an extra hug this season. Well taught and superbly delivered! For those of you with music interests - The music is ‘Half the World Away’ performed by Aurora, the original song was by Oasis.